The only way any of us can please God or approach Him is by faith. “Now faith is being sure of what we hope for and certain of what we do not see¡­ And without faith it is impossible to please God, because anyone who comes to Him must believe that He exists and that He rewards those who earnestly seek Him” (Hebrews 11:1, 6-7). As we have seen the word “faith” both in the Old and the New Testament not only implies “trust” but also “faithfulness.” We are not only saved by believing in Jesus but by believing in Him in such a way that causes us to commit ourselves to Him without reserve. He must become the object of our faith. We must not only believe that He exists but also seek Him with all of our heart. (Jeremiah 29:13) Now we will see from God’s Word three more ways how we can express our faith. 1. We express our faith by not having our hope in this world. From the time he was a baby Moses had been reared in the court of a king. If anyone knew about wealth, power and prestige Moses did. He had everything that the world had to offer. By the standards of the world he was a success yet God had a different perspective. There came a time in Moses life when he left everything behind because he had killed an Egyptian and had been forced to flee for his life from Egypt. In the next forty years God trained Moses in the wilderness for his life’s work. When he returned to Egypt he was a different man. He was no longer conformed to this world but had been transformed by God’s power. The lure of the world had no more appeal to him. He had made the choice to refuse to be known as Pharaoh’s son and had chosen to be mistreated along with the people of God. This was of greater value to him than to enjoy the pleasures of sin for a short time. He chose to suffer disgrace and rejection from the world because he had already made his choice to be faithful to Jesus Christ. This is what the writer to the Hebrews tells us. Yes, Moses knew the Lord Jesus Christ in his pre-existent form before He had come in the flesh. Moses was looking forward to his reward, not down here, but in heaven. His eyes were fixed on eternal realities and not on things of this world. He was able to persevere because he saw Him who was invisible. 2. We express our faith by speaking, believing and by acting on God’s Word. We can express our faith in the words we speak. This is precisely what young David did when the giant Goliath defied the Lord and His people. David called Goliath an “uncircumcised philistine” and in doing this he was declaring that Goliath didn’t have a covenant with God. David’s confidence wasn’t in himself but in God’s Word that had been sealed through a blood covenant with Abraham. David knew the Torah and knew from his past experiences that when he had stood on God’s Word in faithfulness he had successfully defeated his enemies no matter how big they were. Humanly speaking David was facing an impossible situation but his eyes were not on his own ability but on the promises of God’s Word that assured him of the victory. He had five stones in his sling pouch and they represented the Torah (The First five books of the Old Testament written by Moses) When we look at this situation David faced there are three things that he did in this situation. Firstly, David released his faith against the situation he faced with God’s Word coming out of his mouth. David had a practical working knowledge of God’s Word and had proved its power in situations he had faced in the past. He had learned to confront insurmountable problems with God’s Word and had gained the victory every time. He could speak what he believed would happen because in the past God had delivered him according to the promises of His Word. He had killed lions and bears defending the sheep under his care. This situation was no different. David’s confession based on what God had promised released his faith into the situation. He spoke the desired results according to God’s Word and won the victory. God has delivered him in the past and God would do it again! In our faith walk we must not lose sight of how the Lord has delivered us in the past from circumstances and situations that threatened to destroy our faith in Him. (1 Samuel 17:45-47) “David said to the Philistine, “You come against me with sword and spear and javelin, but I come against you in the name of the Lord almighty, the God of the armies of Israel, whom you have defied. This day the Lord will hand you over to me, and I’ll strike you down and cut of your head. Today I will give the carcasses of the Philistine army to the birds of the air and the beasts of the earth, and the whole world will know that there is a God in Israel. All those gathered here will know that it is not by the sword or spear that the Lord saves; for the battles is the Lord’s, and he will give all of you into our hands”. It is the same for us when facing an impossible situation in life. The Lord Jesus is the High Priest of our confession and if our confession lines up with God’s Word then the words coming out of our mouth will come to pass. As our Great High Priest He has authority to preside over the words we speak according to His word and see to it that they are fulfilled in our lives. Not only that but God’s Word will change the way we see things on the inside and bring us to the point where we see ourselves victorious even though the circumstances are still the same. Right now you may see yourself as a failure as a Christian but if you go to God’s Word and find out who you are and what you are in Christ Jesus and what you can become in Christ Jesus through His power then eventually you will no longer see yourself as a failure but succeeding in the game of life. You may not succeed in the way the world defines success but as far as God is concerned you will succeed if you have completed His good, acceptable and perfect will for your life. (Romans 12:1-2) To have successfully completed His will is to be truly successful from God’s perspective and to lay up for your selves incorruptible treasures in heaven. Thirdly, David acted on what he had confessed and believed. The five stones that David had in his pouch represent the Torah, the first five books of the Old Testament written by Moses. Also I believe that Goliath had 5 brothers and if necessary David would have taken them down as well! When David slung the stone he was using the Word of God to defeat Goliath. This is the way the Lord Jesus also defeated Satan in the wilderness temptation (Matthew 4:4) and it is the way we can defeat Satan when he comes against us. With the sling of our mouth we can shoot the “stones” of God’s Word to demolish Satan’s strongholds in our lives and in the lives of others and to change circumstances for the better. Also Notice that David ran towards Goliath with boldness because he knew that God’s Word would give him the victory in this situation. David could run towards the problem because of his absolute trust and confidence in the power of God’s Word to deliver him. He had trusted God in the past to deliver him from all kinds of situations and when the big test came David passed with flying colors. We too can have the same boldness that David exhibited when we confront the devil. We can take the Word of God and hurl it by faith at Satan like a thunderbolt and he will flee. James tells us that when we submit ourselves to God and draw near to Him and resist the devil that he will flee from us. (James 4:7) David also is a type of the Lord Jesus giving Satan his deathblow at the cross. Just as Israel won the day in the light of David’s victory over Goliath so we can win the day over Satan in the light of Jesus victory over him at the cross. 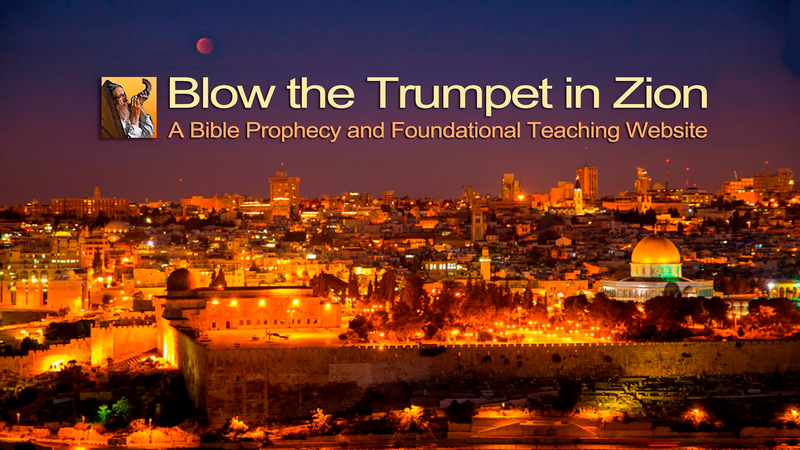 Ultimately this incident teaches us about the destruction of the Antichrist and his forces at the end of the Great Tribulation when Jesus comes again with His faithful followers to deliver Israel out of a desperate and hopeless situation and to establish His Millennial Kingdom on earth. So then genuine faith confesses God’s Word, believes that it will come to pass and acts on that word as if it has already happened. This is precisely what David did! If we act in the same way according to God’s Word then God will deliver us every time from Satan’s power as He delivered David from the power of Goliath. As the scripture says, “Whoever shall call upon the name of the Lord will be delivered!” This kind of faith comes from a regular and diligent reading and studying of God’s Word the Bible. The Word of God, the Bible, is the instrument the Holy Spirit uses to produce and increase faith in our hearts. As it is written; “So then faith comes from hearing and hearing by the Word of God!” (Romans 10:17). The same “spirit of faith” is also seen in Moses when he went into God’s presence on behalf of backsliding Israel and God listened to him because Moses stood on God’s Word. (Exodus 14:13-14) Remember also that Caleb had the same attitude when confronted with the giants in the Promised Land. (Numbers 13:30) He too stood on God’s Word. All of our forefathers in the faith spoke, believed and acted upon the Word of God and God fulfilled His Word to them and He will also do the same for us when we speak, believe and act on His Word. The scripture says, “When the enemy comes in, like a flood the Spirit of the Lord will put him to flight”(or raise up a battle standard against him) (Isaiah 59:19b). 3. We express our faith by obeying God’s Word in our daily living. God’s Word is like a mirror and when we take an honest look into the pages of the Bible we cannot help seeing all of our imperfections and sins. A mirror does not lie because it shows us what we really look like. We may imagine we look like someone else but in the mirror we see ourselves as we really are. God’s Word tells us that our heart is deceitful above all things and desperately evil. (Jeremiah 9:17) We can easily deceive ourselves into thinking that we are something spiritual when we are not. The searchlight of God’s Word points out all of the dark spots that spiritually defile our lives. If we keep looking intently into the Word of God the Holy Spirit will also show us how to remove those spots. When we begin to act on the revelations we receive then we will be set free from every weight of sin that so easily besets us and hinders our walk with God and so run the race set before us by God.